“You just have to not care,” she said. Callous words? Maybe, but they are true and helpful. After an entire year and a half of grad school, performing nearly every day and night, I was still nearly paralyzed with fear that one of those times the words that I had rigorously and thoughtfully memorized wouldn’t be there for me. I only found happiness after a performance, after the show had closed, knowing I was done for the time being with my pre-performance ritual of repeating every line in one long, frantic monologue over and over until it was my time to enter the stage. Not that that it ever helped my jitters, as you know. The idea that I could simply not care about what I was presenting was absurd. These people paid money to see my very best and how dare I not deliver on that promise. Maybe she meant that I shouldn’t care about Failure, which I think is different than caring if a thing is good. Being human and working in a dynamic, live medium, there are a thousand unforeseen things that can cause the best-laid plans of mice and men to fail. If they should…so what? I am terrified of Failure, but let me attempt some reason: If I put forth my best effort, I am delivering quality, even if a well rehearsed line is forgotten along the way. If only logic could cure me. Before the Traumatic Terrible I didn’t care about Failure. I didn’t take myself so seriously as I do now. Before, theatre was just my passion. Now it’s become my life’s Work. It’s not just about me doing something I enjoy; it’s now a thing I bring forth to the world. It’s heavy, Man. That bulk, that effort—it burdens what should be a free-flowing expression. Calling it my life’s WORK really is telling, no? That word is filled with drudge and toil and tiresome must-dos. I’m getting rid of that word. I really hate it now. Work is ironing dress shirts, filing taxes, putting on a duvet cover, moving house. I’m involved in artsy stuff. There must be a more inspiring word for what I do. By the way, I’m not touching on what we all know about art—that it takes skill and practice to honor its creation and that does take Hard Work indeed. This is not what I’m negating here. Once one has achieved a level of expertise, however, Joy must come in to play. In talking about the first solo piece I’d created in grad school, I told my colleagues what a joyful experience it had been. This was the first time a piece had been fully imagined, built, and realized by me alone and with what I was experiencing in that moment of my life, however messy. I brought my expertise to my Joy and the process became effortless. That’s what I want to harness. That’s what will help me replace the word Work. But how is all of this a solution to the moments where I’m standing backstage cycling through lines like an automaton? How does it make me love being on stage? I suppose I could only create theatre pieces that are text free. Not caring, not Working, and involving Joy are about the best possible words of advice I can offer myself regarding this problem. The trick is to get them out of my headspace and into the nerve center of my body. I need to live them to make them real. I reckon this means I’ll need to make and do, be messy and fail, in order for this to happen. Until then, I remain stuck in Part II of the saga. I’m hoping to get to Part III over the course of my PhD. What worries me most about where I am at the moment is the concern that my fear is coloring my decisions as an artist. More and more I’m interested in the directorial, educational, and academic side of theatre. I have the worst feeling that terror is subtly pushing me off the stage. 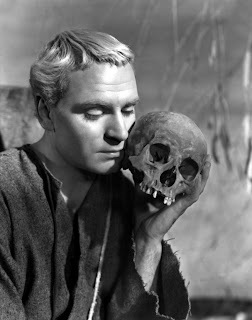 Photo: Fellow sufferer, Sir Laurence Olivier, Source found here. A million thanks for writing this exploration of the psyche. Reading your thoughts helped me come home to my expanded self. A much needed shift since I have recently been indulging in thoughts of having reached my quota of successful performances. A friend of mine has asked me to tell a "BodyTale" on stage, in San Francisco on May 8th. I think you know that allowing a story to spontaneously unfold in front of witnesses (audience) is something I have been doing on and off for a couple of years in Chico, CA. Even though I have been pleased with all five of my performances, My mind tells me that performing in SF is outside the realms of possibility for me. Oh, I so wish I could be there to see you perform! Those stories sound amazing.